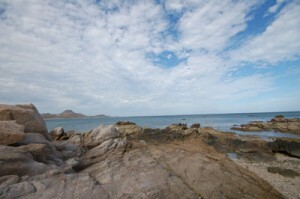 There is a lot to see and visit in Baja Mexico. For those vacationing in Mexico, there is enough to want to come back more than a couple of times to see all that Mexico has to offer. A regular rental car will get you around to the major tourist destinations, but to really experience the best of Baja you need a good vehicle with high clearance and good tires, or maybe a 4X4. For some the highlights are whale watching at Laguna San Ignacio and the rock art in the Sierra San Fransisco. They’re at the northern end of the state. You’ll need a good vehicle or tour to get to both. Many visitors had a very good experience with whale watching trips from their nice campground at the Laguna. Further south, Santa Rosalia (approx northern range limit of endemic Xantus’ hummingbird and ‘Peninsular’ yellowthroat) and Mulege are interesting. Some would like the mountains and pueblos west of Loreto- Comondu and San Javier which will, again require a good vehicle. Then there isn’t much until the top. Backpacking to the top of the Sierra la Laguna (San Lucas robin, Baird’s junco), southeast of Todos Santos, gets you into a beautiful mountain range with some very rare plants and birds (there’s an endemic of mule deer). It can be tough hike, though. The Cabos and Todos Santos are basically touristy, but that might be what you’re looking for. There’s good snorkeling off the Cabos. I should add that if you have the time and like deserts, and plants in particular, it is worth considering going north to the Cataviña area. It’s a long way up there (maybe 1200km from Cabos), but it is what Baja is famous for in terms of natural history. The boojum and elephant trees are very common there, and it is a beautiful desert. And we like Bahia de Los Angeles, a side trip near there. The Baja Handbook is very good resource for those wanting to learn more before they take the vacation in Mexico.